These 2 photographs are part of a larger project titled "Beauty In Hell". 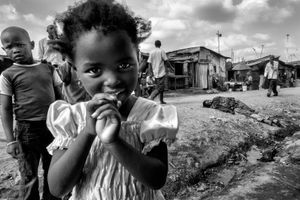 The project objective is to find and document the beauty present in some of the most difficult, poverty stricken and dangerous realities around the world. 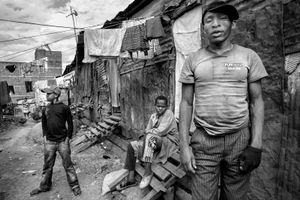 Here two of the largest slums in Nairobi: Mathare and Kibera. “Beauty In Hell” is a critical and personal artistic response to an increased awareness of living within a system that uses drama everywhere. I believe we are now unconsciously accustomed to consider an event interesting and noteworthy only if it contains some form of strong contrast, therefore if it is dramatic. Without drama everything becomes boring, dull and not worthy of our time. In simple terms we tend to use drama to make sensationalism. With "Beauty In Hell" I am trying to express, through artistic sensibility, exactly the opposite and show that also within these extremely hard situations beauty is always present… that the beauty inside the human being is present everywhere, even in places that could only be described as real life circles of Dante's Inferno.